European Roulette from Rival is a great take on one of the world's most popular casino games. 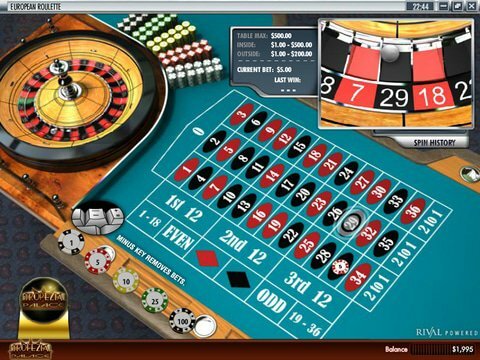 For more than a century, roulette has been associated with luxury and prestige, and now you can learn how to play or practice a new strategy right here on this page with the European roulette free play slot demo that is available with no download and no registration. In fact, since you don't have to install anything, you can even play on your mobile device. European roulette is by far the most popular variant of the little wheel, and that is because it provides the best odds to the players. There's only a single zero pocket and this brings the house edge down low enough to make it a potentially profitable experience. The goal is to choose either a single number or a group of numbers that represent where you believe the ball is going to land once the wheel has come to a stop. You can do this in any number of ways; there are dozens of different combinations from which to choose. Simply click on a chip valued at anything from $1 to $100 and place it on the area of the table that corresponds to your bet. Then, click spin, and hope that you made the right choice! There are many reasons to choose Rival over other software developers, but the fact that they actually let you play for free without having to install software is one of the best. This means that you can learn the rules, play with the odds, and even hone in on a betting strategy long before you step foot in any online or land-based casino. You don't have to spend a penny anywhere until you're ready, and you can continue to enjoy the demo for as long as you would like.